A religious sister ascending the holy stairs in Rome. 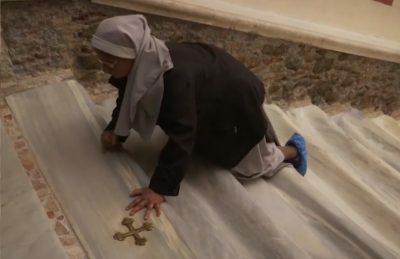 Just in time for Holy Week, the Scala Sancta in Rome has been made accessible to pilgrims after being closed for over a year for restoration works. According to tradition, these 28 steps come from a staircase in Pontius Pilate’s palace in Jerusalem and Jesus Christ stepped upon them on his way to his trial. The marble steps were taken to Rome in the 4th century by St Helena, mother of the Emperor Constantine, the man who made Christianity the official religion of the Roman Empire. The Scala Sancta (which means “holy stairs”), is located in a Pontifical Sanctuary outside the Vatican in what was part of the Papal Lateran Palace. In 1723, the stairs were encased inside a marble frame on the orders of Pope Innocent XIII who feared that the steps were becoming dangerously worn. The steady stream of pilgrims passing along the steps on their hand and knees had caused dips in the stone that were up to 15cm deep. In the recent restoration, the maple wood frame was removed and the stone is now exposed for all to see. Additionally, the frescos in the stairway surrounding the steps have been cleaned and returned to their former glory. Following the unveiling of the restored stairs on Thursday by the Cardinal Vicar of Rome, Cardinal Angelo De Donatis, the stairs will be accessible for a period of 60 days. Between now and 9th June (Pentecost Sunday) pilgrims may make the journey along a route that literally follows the footsteps of Our Saviour.